Demand is soaring for condominiums in Washington state — so why are so few of them being built? Developer Ron Wells turned apartment units in Finch Hall into condominium units — but it's a lot more difficult to build condos from scratch. 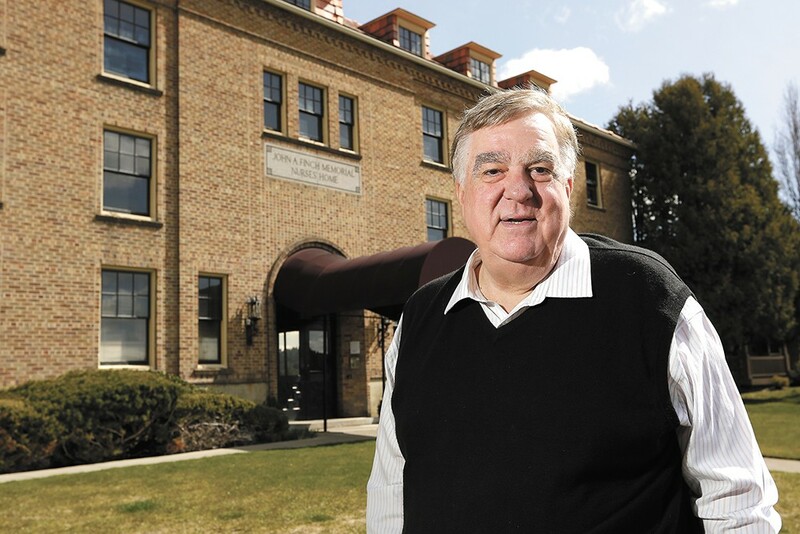 With the decade-long quest to resurrect the downtown Ridpath Hotel into a residential complex almost complete, developer Ron Wells' ambitions have turned skyward. He has a vision of a new downtown tower, one that would rise far above every current building in Spokane. He pictures a thin 40-story residential skyscraper rising up from a Diamond parking lot in downtown Spokane. There would be 25 floors of apartments topped with 15 condominiums. He's talked to financers, to Diamond Parking and already got some preliminary design work completed. Still, it's a long way off, with plenty of hurdles in the way. "I've developed and sold more condos downtown than anybody," Wells says. So he knows the lay of the land as well as anybody. In Washington state in particular, building condominium units from scratch can be a nightmare of regulatory, financing and legal challenges. By contrast, if this were Florida? "I could put this out there, and I could start selling condos... for a prayer and a promise to sell air in the sky," Wells says. "I'd be off and running. It would cut off five years of what it will take me to do it." And because creating condominium units would be so much simpler outside of Washington, he could build a lot more of them. "It would be easier to collect the money," Wells says. "I think the demand is there." Lately, the city of Spokane has been seeking to create more density, attempting to address the region's housing shortage by creating more housing in a smaller space. In most states, condominiums — defined as units in multifamily complexes that are owned by residents instead of rented — are a crucial way of doing that. But developers have struggled to get condo projects off the ground in Washington. Between 2011 and 2016, there were permits filed to create 110 condominium units in Spokane County. That's a number dwarfed by the more than 5,700 permits filed in total for multifamily complexes during the same period, not to mention the more than 7,000 permits filed to build single-family homes. As observers look to the future — and to the housing crisis playing out to the western half of the state — many are worried. "I'm looking at the next 30 years of growth, there's certain trends that really concern me," says Spokane University District director Lars Gilberts. "If it's not addressed soon, you get too far behind and you can almost never catch up." Any time a city tries to create more dense developments, there are a lot of tensions at play. But a big one is between renters and buyers. "It's more likely for somebody who owns the property they live in to take care of their property," says Rick Biggerstaff, president of the Browne's Addition Neighborhood Council. But condos, Gilberts says, bring the benefits of both density and home ownership. "Condos inherently help build density," Gilberts says. "People care about their community. They're investing in their community." Spokane has relatively low-cost apartments. And Spokane has pricier single-family homes. But today, developers like Wells and Greenstone's Jim Frank lament the city's "missing middle." There are very few options for retirees who want to downsize and don't want to keep dealing with lawn care. And there are very few options for the 26-year-old who wants to live in the city — but doesn't want to keep renting. "It seems ridiculous when rents keep going up," Gilberts says. "You're giving away that money every month. You're not building anything. It gets frustrating at a certain point." Without condos available, young buyers have to pay higher prices for single-family homes — and get pushed to the suburbs. Gail Luxemburg, CEO for Habitat for Humanity in King County, speaking before the Legislature this year, stressed the importance of being able to to have a mix of incomes in the middle of a city. "We know that having low-income homeowners in a city creates diversity," Luxemburg says. "To have a vibrant city, you want to have people who stay in place." In dense cities like Atlanta and Chicago, she says, Habitat for Humanity assists clients in becoming condo owners, just like they do with homeowners in suburban locations. But Washington state is different. "There's no opportunity for us to do that today while there are no condominiums being built," Luxemburg says. Inherently, condo development can be complicated. Wells, who spent years untangling a mess created by a scam artist's condo divisions in the Ridpath, knows that well. "Here's the problem," Wells says. "Washington state has the most socially progressive consumer protection legislation in the country for condo buyers." A paper for the Washington Center for Real Estate Research identifies the major culprit: the 1989 Washington Condominium Act. The act, crucially established, gave new condo units an automatic warranty — allowing condo associations boards to sue over "significant defects" in the construction. But starting in the late '90s, aggressive lawyers began taking advantage of that law, finding frustrated condo boards willing to sue over expensive construction problems, like water damage. "It was trying to protect consumers," Rep. Tana Senn, a Mercer Island Democrat, says about the state's condo law. "But it just went overboard in terms of really stopping the whole market." Legal bills skyrocketed. The number of firms selling insurance to protect condo developers from litigation plummeted, while the cost of that litigation soared. Today, even the architects struggle to find insurance to design condominiums because of the legal risks. "Condo prices have begun to rise and would climb sharply if no solution is found," the Seattle Times prophesied in 2003. A few minor legislative changes in the early 2000s did little to address the underlying issue. Instead, as the housing bubble inflated, the wildly loose lending standards temporarily obscured the problem. "You could fog a mirror and get a mortgage," says Seattle-based condo developer Dean Jones. "You had cabbies that were getting condo tips from hairdressers — there was too much false demand." But after the recession, Wells says, banks just flat-out didn't want to give loans to people who wanted to buy a condo. Too risky. Part of the trouble, he says, was that in Washington state, condo associations have incredible power: If you fail to pay your monthly dues for six straight months, the condo association can actually foreclose on your property. And if it does, the condo association has priority — they get paid back before many of the property's other creditors. "The East Coast banks lost a bunch of condos that way in Washington state," Wells says. "Their first reaction was kneejerk. If there was a problem that might be systemic, they apply it to the whole universe." Banks wouldn't lend to would-be-condo owners, and so they certainly didn't want to give loans to would-be-condo developers. Wells says that financiers are gradually coming around to condo units. But it hasn't been able to keep up with demand. In Seattle, where some one-bedroom condos list above $500,000, demand is so high that would-be-buyers literally camp out — like it's an iPhone or a Star Wars movie — to have a chance to put in a bid. Condos are being built in Seattle, yes, but not the sort accessible to the average person. "If you're going to build them, you're going to build really expensive ones, or it doesn't pencil out," Senn says. "You're cutting off a stream of affordable housing." The city of Spokane has tried to make it easier to create density. It recently passed an ordinance allowing slightly more density to be built in the single-family home zones immediately surrounding the city's designated "centers and corridors." But Wells, who served on the city's infill committee, says the density increases were so small as to be essentially a waste of time. "It's horrible," Wells says. "It's worthless. It's ineffectual." But there's little the city can do, beyond lobbying, to address the condo issues affected by state laws. States like Nevada and California have already reformed laws in their states to try to ease the burden on condo developers. Some groups want Washington to do the same. During this year's legislative session Senn introduced a bill to attempt to ease the regulatory burden in Washington state. Right now, all it takes is, say, four of a seven-member condo board to be convinced to sue on behalf of the complex of hundreds of condominiums. Senn's bill would have required at least half of the homeowners to decide to sue — and it would give developers a chance to present a plan to repair the problems instead of fighting a legal battle. "It gives the developer a chance to say, 'We have to fix it,'" says Eddie Chang, a state director of the Washington Association of Realtors. "It gives the homeowners the chance to make the decision." But while the House Judiciary Committee was supportive, Senn says that Senate Judiciary chair and Seattle Democrat Sen. Jamie Pedersen — concerned about protecting consumers — was opposed to the bill. In the meantime, many condo developers have figured out a way around the warranty problems. Build apartments first, and then — after the warranty period expires — convert them into condos. Many of Wells' condo units — like those in the Poplar building in Browne's Addition and Finch Hall in the Kendall Yards area — are apartment units converted into condominiums. But with the rental market already under pressure, there can be serious downsides to largescale apartment-to-condo conversions, instead of new construction. "It scares me a little bit," Gilberts says. When Gilberts was living in Florida, he saw what happened firsthand when the condo market exploded. "The conversion from rental to condos was so significant, the pressure it put on the rental market — the rents just skyrocketed," Gilberts says. "If we think we have a homelessness issue now?" In the end, he says it's about creating a balanced diet, in a sense, of housing options: You need a decent mix of apartment units, single-family homes, townhomes and, yes, condominiums. The original print version of this article was headlined "Locked Out of Condos"